The STM100C module provides pulse and waveform stimulus outputs for nerve conduction, evoked response (e.g. ABR studies audio stimulus-response (e.g. startle response) and somatosensory response studies. The Stimulator setup in AcqKnowledge provides easy-to-modify single-, double- or multiple-pulse sequence outputs of any polarity. The Stimulator setup screen also provides standard sine, triangular and square wave outputs for other kinds of physiological tests. Create an arbitrary waveform by modifying an existing wave or reading in a sequence of user-specified numbers (text file). Stimulus duration, repetition, onset and amplitude are completely programmable. For interactive changes during recording, stimulus amplitude levels can also be controlled manually. Overload and pulse stimulus indicators are positioned on the module’s front panel for easy viewing. 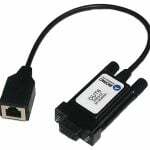 The 50 Ohm output port can simultaneously output a trigger or analog signal to piezo transducers, recorders, oscilloscopes, meters, etc. The External Stimulus output port on the STM100C can be used to drive headphones or tubephones directly. 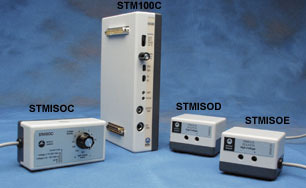 In addition to providing computer control of stimulus waveforms, the STM100C can also buffer signals from any Biopotential or Transducer module, which has its output directed to the STM100C input during recording. With the OUT101 ear tubephone, the STM100C can output a series of clicks or tone pips for auditory brainstem response (ABR) testing. 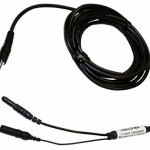 With the OUT102 piezo transducer, the STM100C can provide an audible indicator, or alarm, when signal levels cross pre-defined thresholds. With the TSD190 haptic (tactile) stimulator, mechanically stimulate a 1.5 mm diameter area of skin surface; both plunger force and travel can be infinitely adjusted between zero and a specified maximum value. 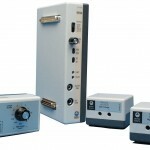 Use to perform somatosensory and other types of tactile sensory tests; the TSD190 can be employed in an averaging-type sensory nerve test to determine the activation threshold and speed of propagation of somatosensory nerves. 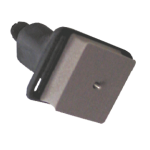 With the STMISO series stimulus isolation adapters, the STM100C can provide high voltage or constant current stimulus output for nerve conduction (see NERVE1 nerve chamber), somatosensory and other types of stimulus response studies. With the CBL105 and CBL202, the STM100C is capable of driving a low voltage (10 V) nerve conduction chamber directly (without a STMISO). 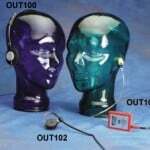 To listen to signals from other module outputs during acquisition (e.g., EMG or heart sounds signals), use the OUT100 headphones.